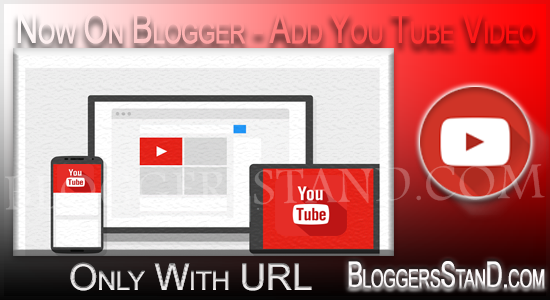 How To Add You Tube Video Only With URL In Blogger Template | BloggersStand ';-1!=b.indexOf("img.youtube.com")&&(a=' ');d=a+''+p+''+titlex+"
Hello Folks,Today we are come with a unique trick to embed you video directly with url only no more embed code :) etc.In this post we will explain How to Add YouTube Video With URL Only In Blogger Template.Lot's Of visitors asking for this thing and today we have developed this trick and we are presenting infront of you.The benefits of this trick is that you can just write the url of your video and your blogger template will display with YouTube URL code is totally responsive and we have tested in all versions and its working perfectly.And it will also not effect your page speed.We are using java script and for styling some CSS. How youtube url trick works? Just go and create a new post and copy the url of your desired you tube video and paste it in the post editor box and publish it.To grab this trick just follow the steps mentioned below. Step .4 Now Paste the following below code just above </body> tag. Step .6 Now paste the Following below code just above </head> tag. Step .7 Now Save your template..Done ! Learn trick how to embed youtube video in blogger blogspot template without embed code.tutorial on how to automatically add youtube video only with url working with blogger template. 0 Comments on "How To Add You Tube Video Only With URL In Blogger Template" So Far - Post Yours!